Dale Peck, 2009. Sprout Bradford is a gay teenager with green hair, an alcoholic dad, and a trailer for a home, all smack in the middle of Kansas. He’s fairly well accepted at school, maybe because he owns all his oddities rather than trying to hide any of them. Or maybe it’s because he really is pretty normal next to Ruthie, his best friend, whose scrawniness, wedge-cut hair, and eighties obsession are just a few of her defining quirks. For the first half of the novel, Sprout and Ruthie are inseparable, except on Saturdays when Sprout goes to visit his (also alcoholic) teacher, who’s prepping him for a statewide essay contest. This involves a lot of practice writing, excerpts from which provide much of the info about both Ruthie’s and Sprout’s backgrounds. But by the second half, Ruthie has been summarily replaced by Ty. Ty is a legitimately weird new kid with family problems of his own, and soon he and Sprout are, if not boyfriends, at least sharing secrets and hooking up regularly. And then there’s Ian Abernathy. That’s the name of the now-stock character in any gay teen novel: the outwardly-homophobic-but-secretly-gay jock. He taunts Sprout early on with the usual slurs, but ends up making out with him, literally in a closet, repeatedly throughout their shared adolescence. Only Ty puts an end to this – well, and Ruthie, who ends up with Ian. 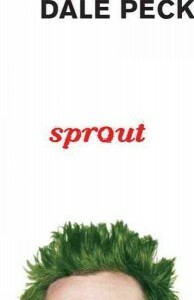 The main characters of Sprout are complex and appealing (except for Ian), and the supporting cast has depth. The plot is coming-of-age, but who doesn’t like a good bildungsroman? Highly recommended. Published simultaneously in ALA’s GLBT Round Table Newsletter. This entry was posted in 2009, Dale Peck, gay male, gay-bashing, high school, problem novel, queer protagonist, realistic. Bookmark the permalink.